"Two years ago I lived in rural Laos in South East Asia for about 1 year. I worked with the Lao Red Cross in Xiengkhouang Province, trying to establish meaningful programs for the local communities. On a daily basis I was humbled by the stark contrasts between everyday life in rural Laos and the life I was used to living in Australia. When the need is so great it can be hard to see where you need to begin. Together with my colleagues at the Lao Red Cross we identified that there are two basic needs which we can address with the knowledge and resources available: hygiene and first aid. Addressing poor sanitation and unsafe hygiene behaviour by promoting hand washing with soap greatly reduces the incidence of some of the deadliest diseases for children under 5-years old. The program we implemented- and which needs support in expanding- recycles soaps from hotels and guesthouses. 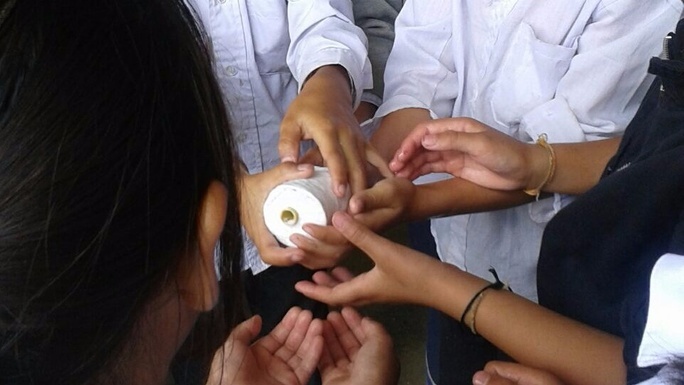 These are remould and delivered, along with hygiene education, to local primary schools in Xiengkhouang Province. Basic knowledge of First Aid is something hard to come by in Laos. There is an urgent need for this knowledge as it is the most heavily bombed country in the world per capita. When we are faced with infinite possibilities to donate and lend a helping hand it can be difficult to know just who and what to support. Since my return to Australia I have remained connected to Laos. I sincerely wish to help the Lao Red Cross in Xiengkhouang expand this life-saving school soap program, as well as training school teachers in First Aid."